Is the new Apple TV worth $149? The all-new Apple TV has gotten a true makeover: It has been jam-packed with new features, a new remote, new apps -- and a steep new price. 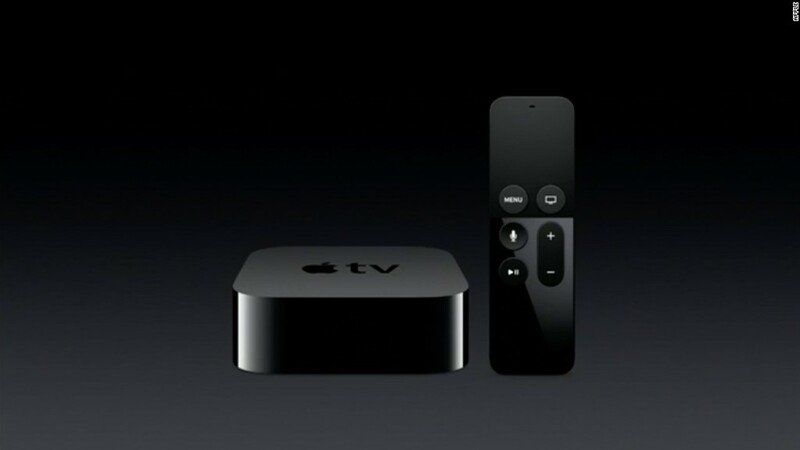 Apple's latest set-top box costs $149 ($199 for the twice-as-spacious 64 GB model). That's more than double the $69 customers had to shell out for the last iteration. So is it worth your money? Let's take a look at the new Apple TV's features and compare them with the competition. You can now yell at your TV -- and it will listen to you. It's a neat feature: Just touch the microphone button on your remote and tell your TV what you want to watch. The Apple (AAPL) TV lets you say commands like, "Show me action movies," "jump ahead 7 minutes," or even, "What did she say?" With that last feature, the Apple TV will go back a few seconds and turn on closed captioning. The ability to speak to your television is hardly unique to Apple TV. The feature is baked into many smart TVs, as well as the Roku 3, Xbox One, PlayStation 4 and Amazon's (AMZN) Fire TV. It even comes standard on Comcast's (CCV) Xfinity cable boxes and remotes. The new Apple TV remote features a glass touch surface so you can navigate the Apple TV with swipes and gestures. It connects to the Apple TV via Bluetooth, so you don't need to point it right at the box (but you do need to charge it every three months). It lets you control the volume on your TV, and it has a Nintendo Wii-like built-in motion sensor, so you can play video games and use your remote as a virtual baseball bat or pool cue. Though the touch surface is particular to the Apple TV, many competitors, including Google's Chromecast, Fire TV and many cable apps, allow you to search for programming directly on your smartphone. Touch is compelling but not necessarily a game changer. Apple TV will now search across multiple apps. So you can search for a movie, and it will show up on your screen whether it's on Netflix (NFLX), Hulu, HBO or any number of other apps -- you no longer need to search inside every single app. That's a fantastic feature -- but also not unique. The Roku, for example, lets you search by title, actor or director across all your apps. The new Apple TV will run on "tvOS," which will feature a third-party app store. It will open up the set-top box to new third-party content, apps and games. Apple has actually been a longtime holdout on opening up its set-top box to third parties. It has featured many TV networks and streaming services, but it never allowed games, apps and other third-party content the way that Roku, Amazon and Google have. Apple repeatedly said the new Apple TV is a "a foundation for the future of television," not-so-subtly hinting that the device is ready for those pesky TV networks to play ball. So much of the content on Apple TV and its competitors requires you to have an existing cable subscription, but Apple could one day sell its own subscription service that allows you to bypass your cable company and get TV straight from Apple. This is where Apple could do some real damage. It would seem to be in a far better position to do that than, say Roku, but content companies have also been tepid about accepting Apple as a partner after seeing how Apple dismantled the music market with iTunes. The Apple TV, which ships in October, costs far more than its direct competitors. The industry-leading Roku, for example, starts at $50 and goes up to $100. The top-of-the-line Roku 3 has virtually every feature that Apple announced, right down to the motion-control remote for games and voice search. But the Roku 3 offers more content, compatibility with non-Apple smartphones and PCs, as well as a headphone jack on the remote for private listening. Even cheaper competitors include the $35 Google Chromecast and the $40 Amazon Fire Stick. Neither are as powerful as the Apple TV, but if all you want to do is stream movies, TV shows or play games (and, face it, that's probably all you need on your TV), you can get far more value for your money. The Apple TV could be a more compelling product if Apple starts selling a subscription TV service alongside it. Until then, your money might be best spent elsewhere -- even on Apple's older set-top box, which can still be had relatively cheap.